KSI Bogota provides an international education to learners aged 4 - 18 years. The School is an IB world school and is committed to offering the IB programmes as its core educational curriculum. It also offers the Colombian National Diploma to all qualifying graduates. KSI Bogota is currently pursuing AdvancED/SACS accreditation in order to offer US High school credits and diploma at graduation. We are targeted to complete the accreditation process in the Spring of 2018. KSI Bogota is an IB World School and committed to offering the IB programmes as its core educational curriculum. The IB offers three programmes which provide a continuous international educational experience from early childhood to university age. The IB Learner Profile is at the heart of this common curriculum framework and embodies what the IB means by international mindedness. KSI Bogota is authorised in the IB PYP and DP. The School is currently pursuing its International Baccalaureate MYP authorisation. Lessons are taught in English and/or Spanish. We have traditional language lessons but also integrate technology and language learning with the use of the immersive language programme Rosetta Stone. The Primary Years Programme is designed for students aged 4 to 12 and focuses on the development of the whole child as an inquirer, both in the classroom and in the world outside. It is a framework guided by six transdisciplinary themes of global significance. Themes are explored using knowledge and skills derived from six subject areas. The six subject areas identified within the PYP are Language, Mathematics, Science, Social Studies, Arts, Personal, Social and Physical Education. The themes allow teachers to incorporate local and global issues into the units of inquiry and support children’s learning outside of the confines of learning within just subject areas. Each theme or Unit of Inquiry lasts approximately 6 weeks for Years 1 through 6 and 9 weeks for Kinder classes. To help measure progress children will take the Measure of Academic Progress test twice a year to monitor their growth from the beginning of the year to the end of the year. Teachers engage in data discussions to set academic goals for the school, the grade level as well as the individual student level. 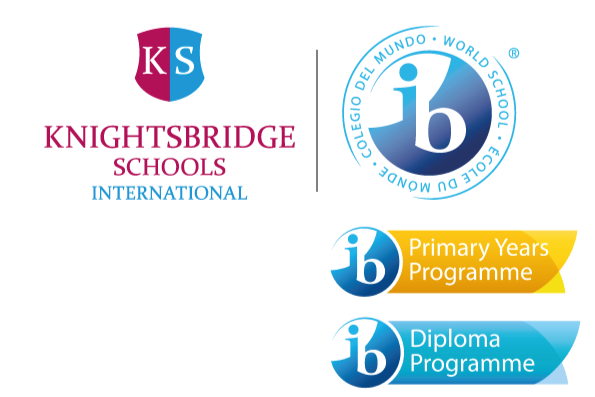 Knightsbridge School International – Bogota received its IB Diploma Programme (DP) authorisation in May of 2015. The DP is offered to students aged 16 to 19 during the last two years of secondary school. It is an academically challenging and balanced programme of education with final examinations that are sent to the International Baccalaureate Organization for external marking at the end of the second year. The programme is aimed at preparing students for success at university and life beyond and has gained recognition and respect from the world’s leading universities. It has been designed to address the intellectual, social, emotional and physical well-being of students. Creativity, Action, Service (CAS): This involves students in a range of activities alongside their academic studies throughout the Diploma Programme. Creativity encourages students to engage in the arts and creative thinking. Action seeks to develop a healthy lifestyle through physical activity. Service with the community offers a vehicle for a new learning with academic value. The three strands of CAS enhance students’ personal and interpersonal development through experiential learning and enables journeys of self-discovery.